The Abarth 500 is pint-sized and packs plenty of fun. It’s a sprightly supermini that’s quite punchy and pokey. 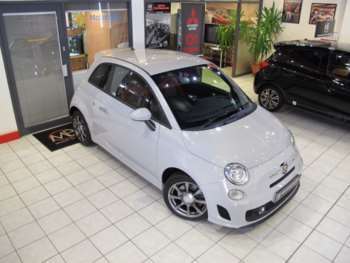 Putting it simply, a used Abarth 500 is a sporty version of the Fiat 500, so it looks pretty much the same but has more performance. It was unveiled at the 78th Geneva Motor Show, a year after the rebirth of Abarth brand and company. Fiat are great at small cars and the standard Fiat 500 oozes retro chic with a genuinely compact body. Underneath, the 500 is based on the second-generation Panda, which is a great little city car itself. What you lose in terms of practicality with the 500 when compared to its Panda donor car, you make up for with bags of style. Inside, the cabin is a very clever combination of more retro touches and careful modern styling. The Abarth variant adds a sporty body kit with skirts and powerful-looking bumper at the front to accommodate the turbo. You'll also find upgraded instruments, such as a turbo pressure gauge and an LED to tell you the best time to change gear. A used Abarth 500 will take you from 0-60mph in second gear in 7.6 seconds and on to a top speed of 128mph. You may experience a bit of turbo lag at low revs, but this tends to disappear over 3000rpm. 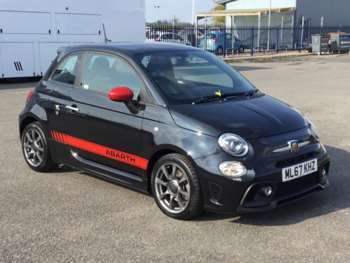 The Abarth feels particularly solid and well planted on the road with the steering being incredibly responsive, making for a sharp driving experience. On smooth roads and on tracks it feels glued to the road but on bumpier tarmac the ride can feel decidedly firm. When you want a little more oomph, pressing the sports button sharpens up the little scorpion and allows it to deliver its ultimate sting. All things considered, the Abarth produces exactly what a hot hatch should; bags of performance and fun in spades.